We are very proud that the Department has won a Queen’s Anniversary Prize for the University of Reading. Our submission, ‘Design for reading: teaching and research in typography and graphic communication’, was awarded a 2010–12 Prize in recognition of the excellence and world-wide reputation of our research and teaching and learning. The Design & Print Studio’s unique work with students was also part of our submission. Your can read more about the Prize here, and download our press release and information about our research, enterprise, teaching and learning, and collections (warning – large file!). 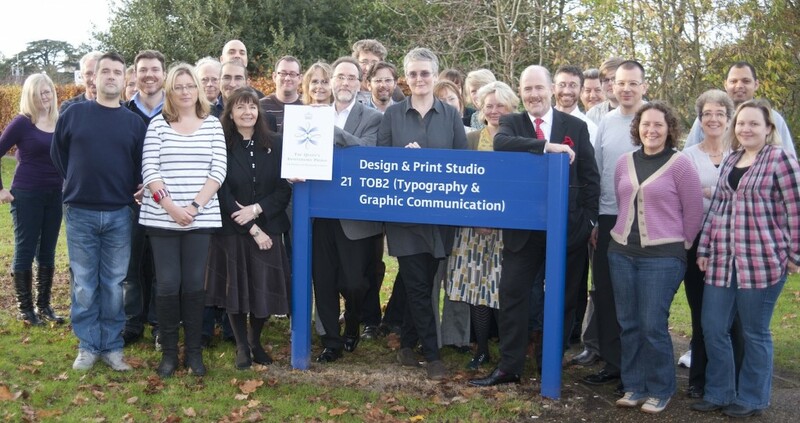 The photograph show members of the Department and the Design & Print Studio with Acting Vice-Chancellor Tony Downes.